As the County Fire near Guinda ballooned to more than 44,000 acres over the weekend, UC Davis faculty, staff and students not only responded to the fire but also took steps to protect one of the university’s natural reserves and safeguard animals. 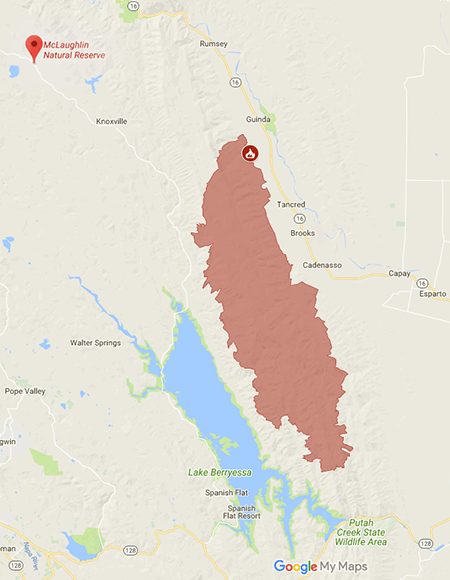 Saturday afternoon (June 30), a three-person campus fire crew joined the initial attack on the fire in western Yolo County, and has since returned safely — sent back because other crews had arrived from elsewhere in the state, and officials needed to restore coverage in the rest of Yolo County. At UC Davis’ McLaughlin Reserve, about 15 miles from the north end of the fire, staff and interns tended to plantings in a creek restoration area, in case the blaze changed direction and headed toward the reserve. Catherine Koehler, reserve director, described how staff and interns were removing plastic tubes from around the small plants, because fire could “shrink-wrap” them and be even more likely to cause harm. Koehler said this morning (July 2) the fire was not threatening the reserve, but she wanted to get the work done now, in case there wasn’t enough time later. As of this afternoon, Cal Fire reported the County Fire had spread into Napa County and was the largest fire at this time in the state. No structures had been lost, though more than 100 were threatened. The firefighting force had grown to more than 1,200 and had managed to contain 3 percent of the fire. Sunday (July 1), three faculty members and five students from the School of Veterinary Medicine’s Veterinary Emergency Response Team, or VERT, prepared to help animals that may be evacuated from the fire zone. At the fire command center at the Yolo County Fairgrounds in Woodland, the faculty members consulted on evacuation and emergency sheltering plans and the students helped set up an emergency small animal shelter. The Fire Department’s Brush Truck 34 responded to the County Fire only a day after returning from the Creek Fire near Redding. Capts. Tait Nilsson and David Stiles and firefighter Gerrit Dykzeul spent a day on the County Fire before being sent back to campus. “Because the initial attack that we were involved in depleted so many Yolo County resources, Cal Fire and the California Governor's Office of Emergency Services worked quickly to bring in responders from outside the region, allowing our crews to return home early yesterday,” Fire Chief Nate Trauernicht said. While the fire’s smoke drifted south to the Bay Area for much of the weekend, a shift in wind direction prompted a warning today from the Yolo-Solano Air Quality Management District — about smoke coming into Davis and surrounding areas. The district recommends residents keep windows and doors closed, limit outdoor physical activity, use air conditioners and take other precautions. “Residents that are sensitive to air quality or smoke impacts, such as pregnant woman, the elderly, young children and those with respiratory illnesses such as heart or lung disease and asthma, should take additional precautions if necessary,” it said in the alert.